Firstly the Android OS is made by Google itself, so the majority of Android smartphones come up with Google Drive preloaded. Secondly, Google keeps it updated with all the latest features. The brand Google also takes a big part to assure the users about the safety of their data. 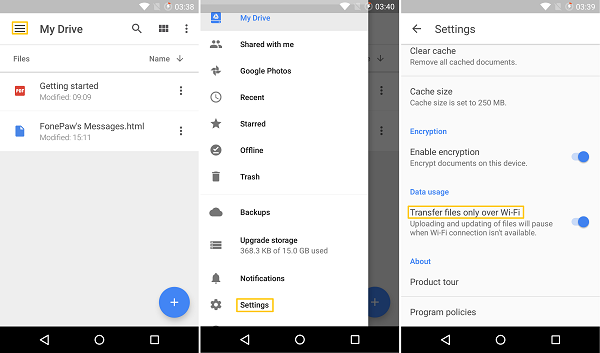 Thirdly, Android users can use Google Drive to backup WhatsApp chats and restore WhatsApp backup from Google Drive. But that doesn’t mean Google Drive is beyond any technical glitches. At times, users seem to face good deal of difficulties to backup the data or synchronize the data. This is not a very uncommon issue with Google Docs, the Google app to create and edit documents. When a user changes the device, he needs to restore the previously saved data from the other phone to the new one. But the process fails due to the occasional technical interruptions while synchronizing. In this article, we are going to elaborate and discuss the possible reasons for this error and the solutions to troubleshoot. Tip: If your Google Play Store stops working too, you can find the solution here. Why Google Backup and Sync is not Working? How to Fix Google Backup Not Working Issue? 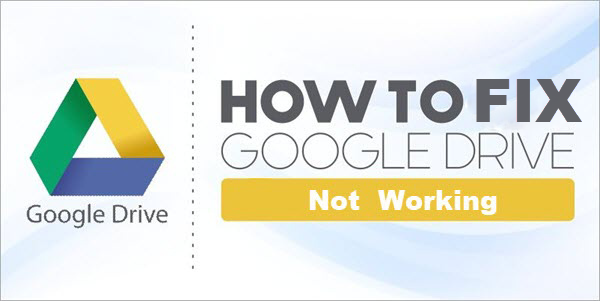 Here are the 5 possible ways or methods to troubleshoot the Google Drive backup and sync issue. Connect your device with a stable WiFi connection. Because WiFi is always preferable for syncing rather than mobile data. If you’re in need to use the mobile data, check the setting first that the “Transfer files only over WiFi” option is disabled, otherwise it won’t perform the sync. You can follow these steps to do that: navigate to Drive > 3-line menu > Settings, and toggle off “Transfer files only over WiFi”. Once you are done, restart your device and recheck the process. Finally, make sure that the sync option in your device is enabled. To check that, please navigate to Drive > click on the 3-line menu > Settings > Scroll down and find Backup & reset, and now enable “Backup my data”. It’s always better to keep your apps updated, it’s important because many times the developers publish a new version and crash the older one so that users forcefully install the latest version. Also, the old version may have bugs that may stop your device to let the process happen so that I will always suggest you to keep the Google Play Service and Google Drive app updated. First, open the app drawer and tap on the Play Store app. On your top left, open 3-line menu. Now from the available options, click on open My Apps and Games. It will show the updatable apps in a list. If there’s Drive update available, click on the Update button to download and install the updated apps. At times, the ease of functioning of an application gets clogged by overwhelming amount of data and cache within it. If you are not habituated with clearing your app cache very once in a while, it might cause you technical trouble sooner or later. To get over it, open the Google Drive in the list of apps in the app drawer of your Settings menu. The above screen will appear on the display. Once you clear the data and cache, the malicious element will probably be gone. Now sign in in the app again and it will run smoothly like before. This is a rather simple trick which works magically in some instances. You have to go to the Settings menu of your phone and click on the Google account option. There you will find the option to sign out. You can also sign out from the particular Google app that was causing you trouble. (Such as, Google Drive). Click on the three lines at the top left corner of your device display. There you will get the option to sign out at the top. Once you have signed out, enter your Gmail address and password to sign in smoothly. Now, you are good to go. Most of the time an app starts malfunctioning because of a misinstallation. When you download the app or update it, the file might face some error during the installation without your knowledge. If that is the case, then it’s better to uninstall the file at once and download it fresh. If you don’t know the shortcut uninstall procedure, then go to the Settings> Apps management> choose Google Drive (or another Google app causing the trouble)> press Uninstall. It’s as simple as that! Tip: How to Recover Deleted Android Files Without Backup? It becomes easy to recover a lost information or file from Google backup. But, what if the lost data wasn’t even saved in Drive? Do you think it’s lost forever? Jihosoft Android Data Recovery is an Android based data recovery app that assists you to recreate the lost files in your device again. This brilliant software is compatible with all the leading global smartphone brands and their models. With the simplest user- interface and fastest recovery module, this tool will make your life much easier. Accidental data loss and virus corrupted data is a history now! How to Make A Photo Album with Song on Android Phone?